Charles Kurzman, “The False Premise of Travel Ban 3.0,” September 29, 2017. Travel Ban 3.0 is based on the false premise that the security of the United States is threatened by the “inadequate identity-management protocols” of seven countries: Chad, Iran, Libya, North Korea, Syria, Venezuela, and Yemen. This process boils down to three criteria: Does a country have the bureaucratic capacity to track its nationals. Which governments are willing to share data with the United States government? What risks do the nationals of each country pose to the United States? But the list of countries targeted for the latest travel ban does not match these criteria. In many poor countries, governments are unable to track their entire population. Birth certificates are not issued to every infant, identity cards lack anti-counterfeit technology, and false documents may be obtained through bribery. If travel was blocked from every country with “inadequate identity-management protocols,” the list would be far longer than seven countries, and these seven countries would not be at the top. Chad’s bureaucracy, for example, is better than some of its neighbors’. North Korea’s totalitarian government keeps precise tabs on its nationals. In Iran, as dissidents know too well, identity-management systems leave little room to hide. Instead, these countries, as well as Syria and Venezuela, are included in Travel Ban 3.0 because their governments were, as the policy proclamation puts it, “uncooperative” with United States demands for data. These governments are hostile to the United States government, which they view as a rogue superpower. In return, the travel ban refuses visas to Iranian and Syrian activists whom the United States wants to support. “We cannot afford to continue the failed policies of the past, which present an unacceptable danger to our country,” President Trump said in a press release announcing the latest travel ban. In fact, there have been no fatalities in the United States since 9/11 caused by extremists from any of the countries on the travel ban. That was true of the previous versions of the travel ban, and it is still true. The supposedly failed policies of past have actually worked well. The policy’s disconnect with actual security threats goes deeper than seven particular countries. The problem that the travel ban claims to address is violence by extremists who were granted visas without “proper vetting and screening.” Just as identity fraud in voting, which Trump also claims is widespread, has caused relatively little harm to elections, so too there has been relatively harm to public safety by identity fraud in immigration. How little harm? Imagine if the United States had banned the entry of all foreign adults after 9/11, not just from seven countries but from all countries, out of concern that they might have radicalized overseas. How many American lives would that have saved? The answer: out of more than 250,000 people murdered in the United States over the last 16 years, extremists who immigrated as adults accounted for 14 fatalities. Those 14 victims were murdered in San Bernardino by Tashfeen Malik, who immigrated at age 28, and her husband Rizwan Farouk, who was born in the United States. Malik was from Pakistan, which is not included in the travel ban. 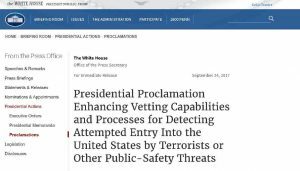 In other words, improper vetting has not been a leading source of threats to public safety in the United States. The fake-procedural verbiage of Travel Ban 3.0 does not make this policy any more sensible than Travel Bans 1.0 and 2.0.